First Line: The winds were changing. The Blitz may be on hold in London, but the blackout is ongoing-- which is a bad thing for females who must travel the streets at night. A killer is butchering young women in exact recreations of Jack the Ripper's crimes, and he is targeting women who are reporting for duty to be Churchill's spies and saboteurs abroad. Officers at MI-5 quickly realize that they need the help of special agent Maggie Hope to find "the Blackout Beast." But once a trap is set, what's going to happen when the murderer sets his sights on Maggie? This is the ongoing story of young American Maggie Hope and her experiences in England during World War II-- and it's a pip. Looking to branch out from Jacqueline Winspear's Maisie Dobbs or Charles Todd's Bess Crawford? Then you must meet Maggie Hope. 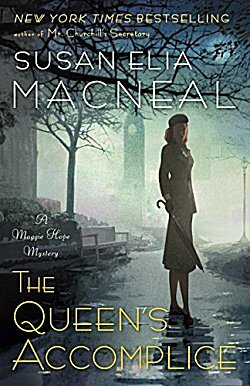 In this sixth installment of Maggie's story, author MacNeal brings home the fact of exactly what female spies faced during the war, and it was ugly. I'm not going to go into any detail because it would just cause my blood pressure to spike. Suffice it to say, Maggie doesn't take kindly to the facts either, and it's going to be interesting to see what kind of fight she puts up against this injustice. But this isn't just a tale of espionage and women's rights. MacNeal turns everything on its head by throwing a homicidal maniac loose on the darkened streets of London. A serial killer? Really? It sounds same old, same old, but it's not. It's exciting and scary and certainly keeps the pages turning at a rapid clip. MacNeal proves that she can write more than "just" women's period drama. Much more. These Maggie Hope stories should be read in order because of continuing storylines, and developing characters and relationships, but if you like richly textured historical mysteries with a strong female lead, you're not going to mind a bit. Bit by bit, more is coming to light about the roles women really played during World War II. MacNeal has done her research, and Maggie is the fantastic result. If you love historical mysteries oozing with period detail, spine-tingling action, and wonderful characterizations, look no further than Susan Elia MacNeal's Maggie Hope. Oh, this does sound good, Cathy. I don't generally like serial-killer novels as much; it's too easy to slip into 'disbelief alert.' But the context here sounds really interesting. Glad you enjoyed it. I think the context "makes it," Margot. This is a great series and I can't wait to read this one too! It is a great series, isn't it?